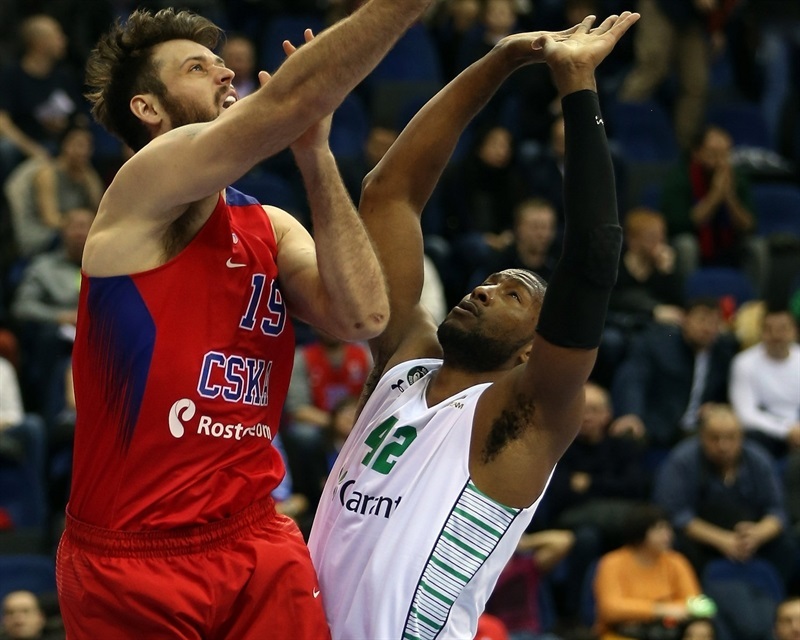 CSKA Moscow registered its fourth consecutive win in style on Friday by routing Darussafaka Dogus Istanbul 94-66 at hom ein the Russian capital. CSKA improved to 8-1 as it heads into Regular Season Round 10 and a winner-takes-all road clash against Unicaja Malaga (7-2) for first place in the Group D. Meanwhile, Darussafaka stays in fourth place at 4-5 and stays and will now play Maccabi FOX Tel Aviv next week in a direct showdown for a spot in the Top 16. 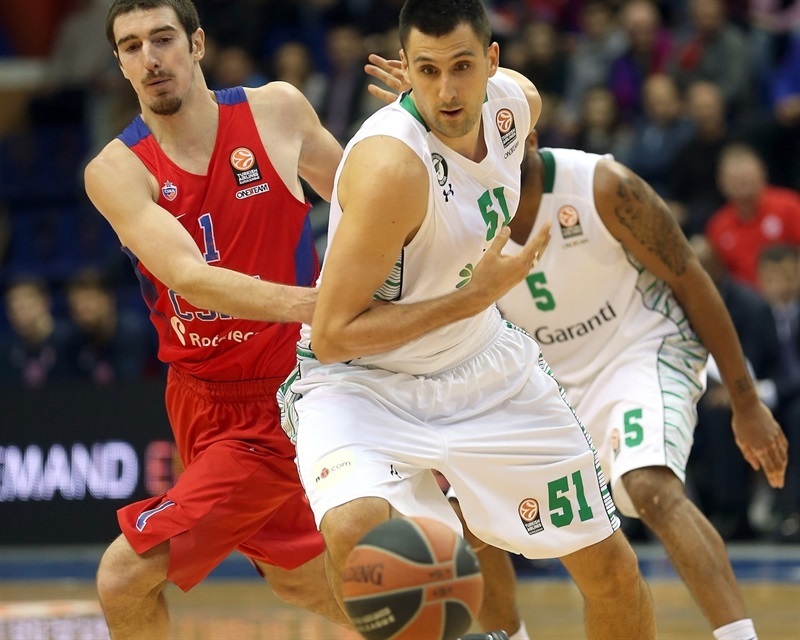 Darussafaka will reach the Top 16 with either a win or a loss up to 11 points. On Friday in Moscow, it was all CSKA. The hosts pulled away to double-digits leads early and led 51-41 at halftime before blowing the game open with a 29-7 third quarter behind Milos Teodosic, Joel Freeland and Vitaly Fridzon. 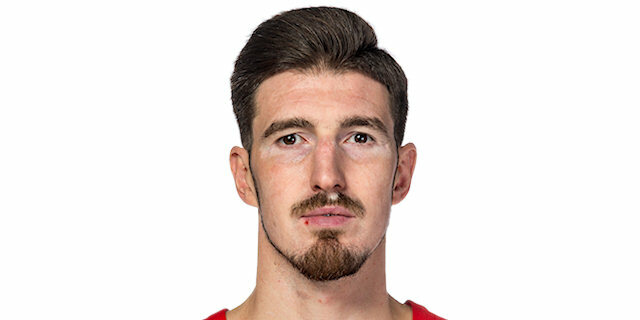 Nando De Colo had 14 points, 7 rebounds and 4 assists for CSKA. Fridzon netted 13, Cory Higgins scored 12 and Demetris Nichols 10. Freeland, in his first game of the season due to injury, had 11 points and 6 rebounds. Teodosic ran the show with 9 assists in less than 22 minutes on the floor. For the visitors, Reggie Redding had 12 points, Scottie Wilbekin 11 and Luke Harangody all of his 10 points in the first half. 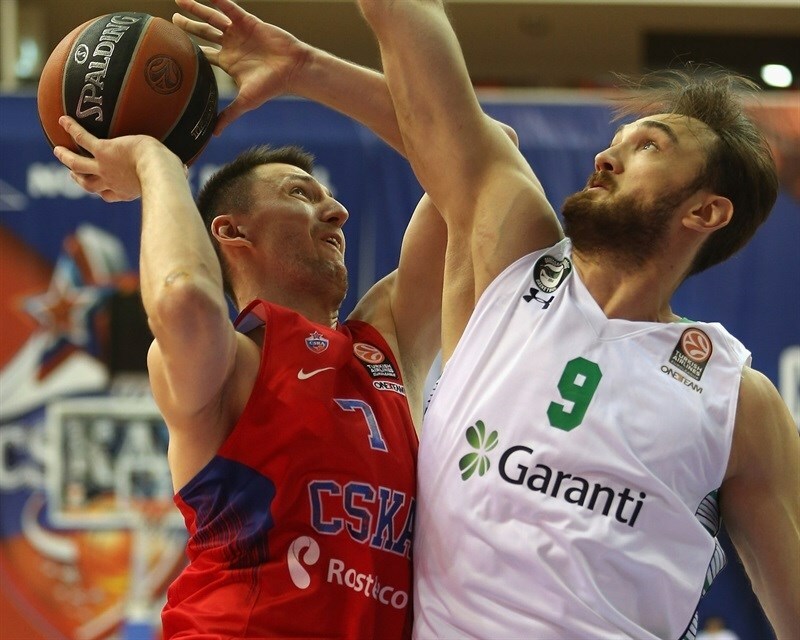 Higgins hit a mid-range jumper for CSKA to open the scoring and Semih Erden used a jump-hook to put Darussafaka on the scoreboard. De Colo scored from close range and Higgins from long , before De Colo connected on another jumper to make it 9-2. 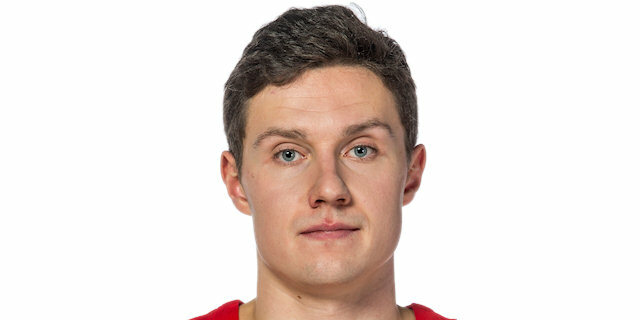 Erden and Kyle Hines traded baskets from close range, before Hines delivered 2 blocked shots – first stopping Redding, then Erden – as CSKA had a total of 5 rejections in less than 5 minutes. De Colo scored from close range again, then added free throws to extend the difference to 15-4 before the visitors got themselves going. Jamon Gordon hit a turnaround jumper and Wilbekin followed with a fastbreak layup. Harangody's layup cut it to 17-12 before Freeland buried a long jumper. But Wilbekin answered with his own, then buried a corner triple in transition to get the visitors within 19-17. 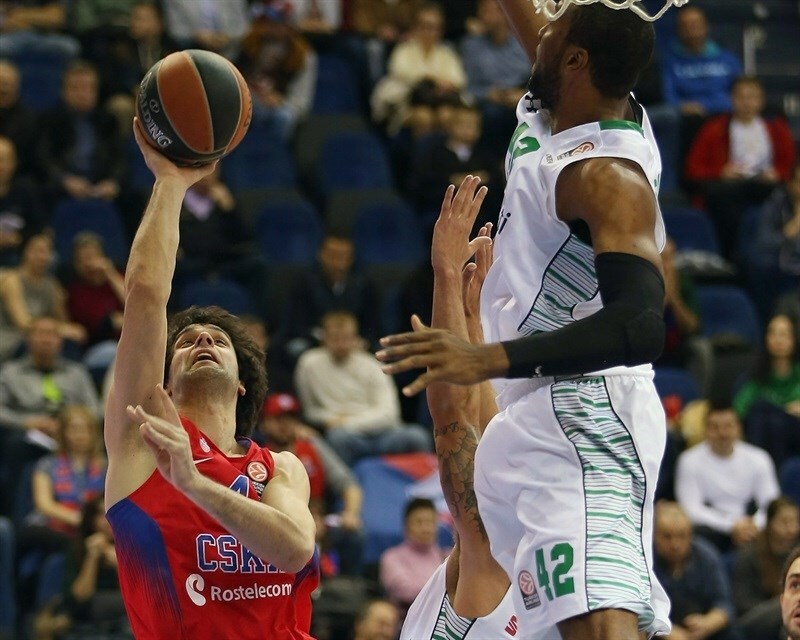 After a timeout, Teodosic knocked down a triple for CSKA. A floater by Gordon was answered by De Colo, who upped his tally to 10 points with a pair of free throws, giving CSKA a 24-19 lead after 10 minutes. 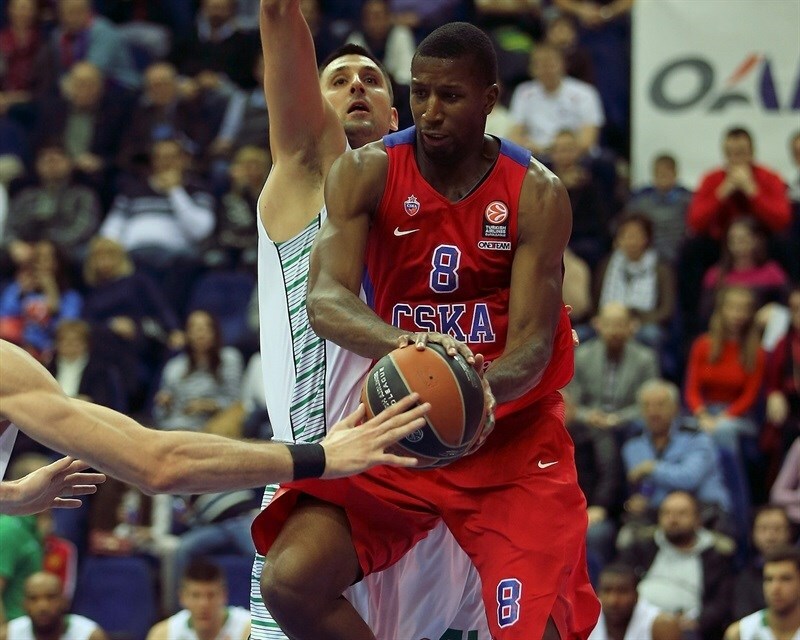 Demetris Nichols opened the second quarter with a put-back dunk, but Harangody bettered it with a corner triple. Freeland made a jumper to which Redding also answered with a triple for the visitors to make it 28-25. Dmitry Kulagin hit a long jumper for CSKA, but Harangody countered with another triple, this time wide open, for a 30-28 scoreboard after 3 minutes of the second quarter. But then Teodosic answered right back from deep and Nikita Kurbanov added his own corner triple, forcing a Darussafaka timeout at 36-28. Kulagin's next long jumper pushed the margin back into the double figures, but Redding had a three-point play and Mehmet Yagmur made a runner in heavy traffic. The visitors' run continued after a timeout, as Redding scored a fastbreak basket to get Darussafaka within within 38-37. Nichols nailed a triple to keep CSKA in front, and Harangody traded baskets from close range with Hines, before Kurbanov finished a fastbreak with a three-point play. 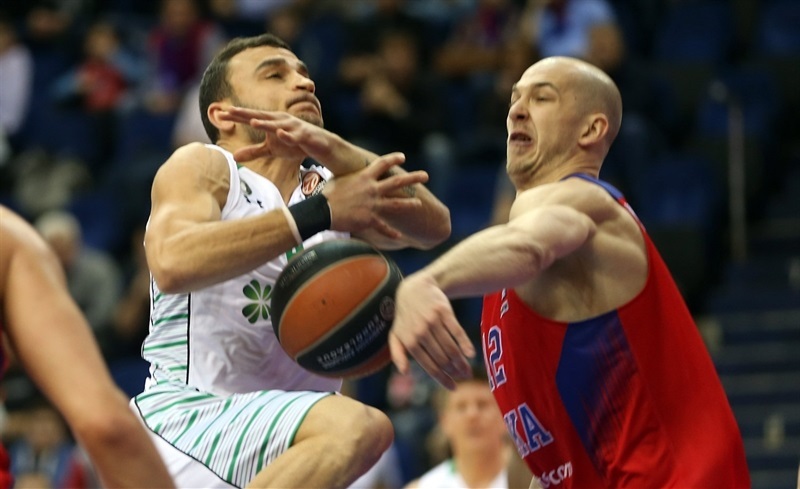 Darussafaka managed only a pair of free throws in the final 2 minutes of the quarter as Teodosic fed Nichols for another three-pointer to keep CSKA comfortably ahead, 51-41 at halftime. Freeland had a dunk to start the third quarter before Vitaly Fridzon hit a baseline jumper. Freeland then added another basket after a dish from Teodosic, making it 57-41. After a timeout, Andrey Vorontsevich nailed a triple as CSKA's margin grew to 62-41. 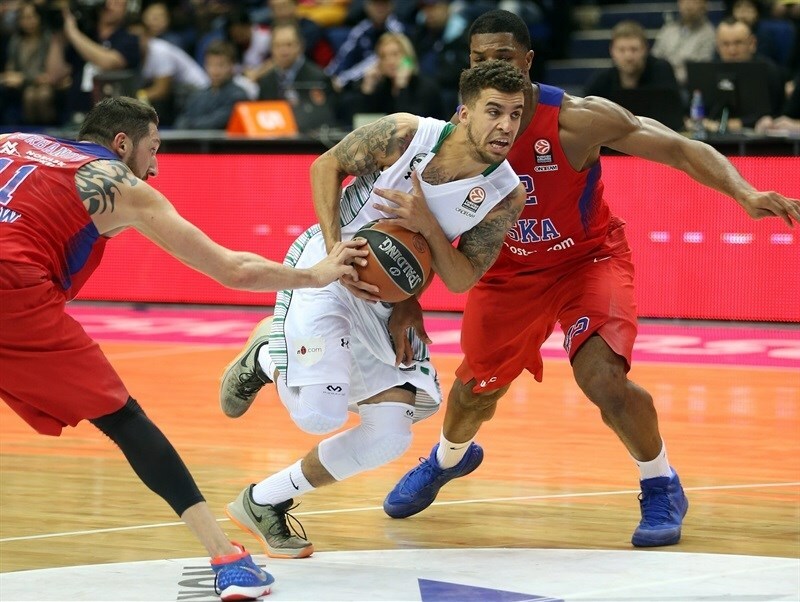 Darussafaka needed more than 4 minutes to score in the second half, until Redding drove for a runner. But Freeland’s three-point play and a Higgins layup after a behind-the-back pass from Teodosic started another run for the hosts. Wilbekin would score a layup on a breakaway, but not before Fridzon started his own run of 8 points, which included back-to-back triples. A driving layup from De Colo opened 77-46 lead. Redding drove for another basket, but Fridzon ended the third quarter with three-pointer, making it 80-48. A one-handed fastbreak dunk by Vorontsevich opened the fourth quarter. Yagmur scored a layup for the visitors, but then layup-plus-foul from Higgins made it 85-52. Yagmur had a fastbreak basket, that Nichols answered with a jumper as the scoring slowed down. 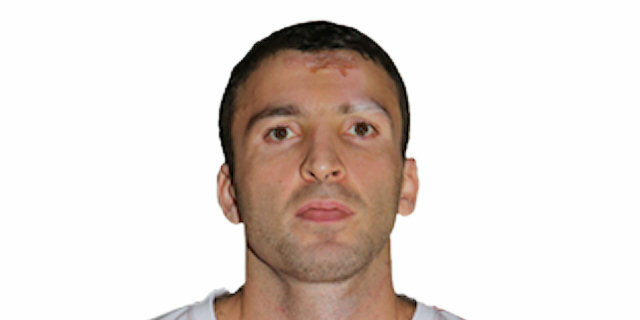 Serhat Cetin had also had an easy fastbreak basket for the visitors, but Kulagin’s triple made it 90-58. Cetin hit a jumper as the game was coming to a close, and Milko Bjelica and Furkan Aldemir had baskets inside to round out the scoring. "We were the better team today and I congratulate my players for a great performance. Our defense had two faces today. In the third quarter we started to fight, to deflect passes, to play mobile. We won the quarter 29-7, showing a great mindset. Obviously, the numbers do not reflect the real difference, Darussafaka has quality, they’ve missed many shots. Still we deserved to win and I would like to congratulate our fans who were pushing us forward tonight." "Congratulations to CSKA for the victory and qualification to the Top 16 and good luck in the next stage. We were fighting in the first half only and in the second the team looked blocked. I expect better reactions, but we turned the ball over, made mistakes, missed shots and let CSKA score fast break points. We knew it is not so easy to win in Moscow, but still, I repeat, I expected a better reaction from my team. We play against Maccabi in the last game to decide who goes to Top 16. We are playing in tough group and it is great that after so many games played we will decide our fate by ourselves." "It was not easy, we just did what we had to do tonight, starting with defense. We really stayed together, that was the first part of this game. After that, we made the difference on offense. Joel Freeland is coming back, so he needs to find his rhythm, but we will help him get better every day." "Today I’m happy, it’s my second game this season. 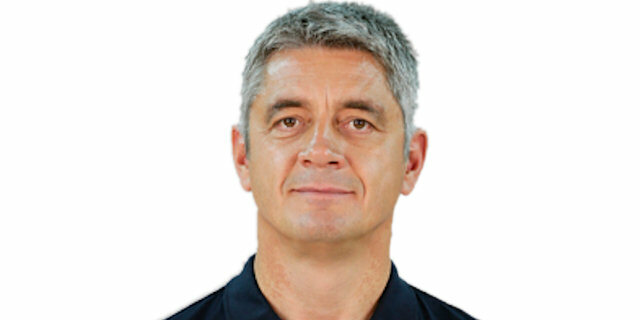 I would like to thank our coach for his trust and a chance to play on court. I was not taken aback. The most important thing is that we won today. Each game is like the last one, we take it seriously." 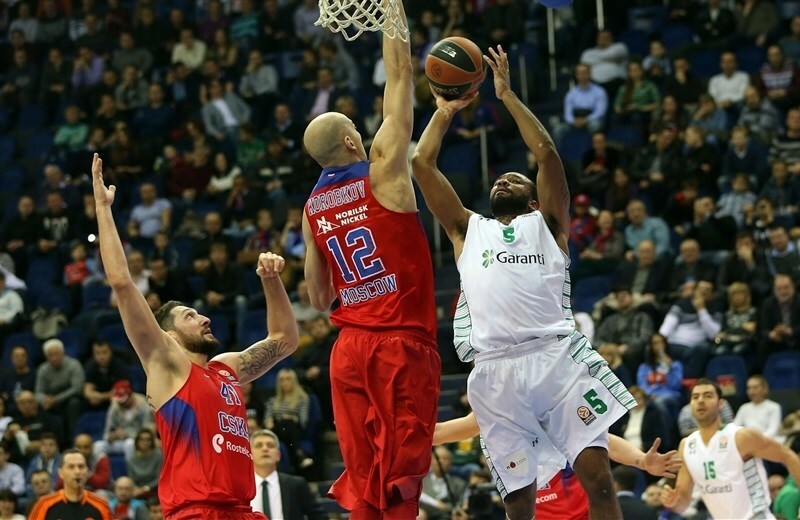 "CSKA played its game in their own rhythm. We were not ready for such a game, it seemed like we lost from the beginning. It was a pity that we didn’t catch up on defense, we showed no character today. CSKA is a very strong team. We had to play better. Our main mistake was mental."